Hidden beneath the skyscrapers and department stores of the city is a little-known but well-established treasure trove of artistic talent and creation. 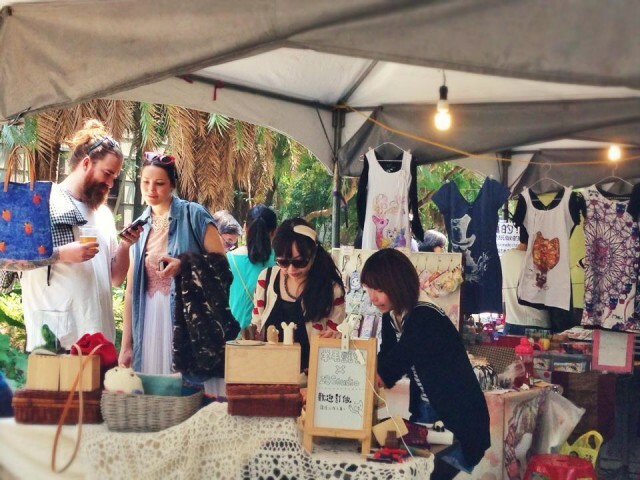 Every weekend, budding artists and designers flock to local art markets to share their latest creations, while locals and tourists turn up to see what hidden treasures they might dig up this time. Art markets are quickly becoming an emerging trend across the island. According to the website PIXNET, there are more than 100 art and flea markets taking place in Taiwan every year. Online discussions about art markets exceeded 2174 articles yearly, averaging 6 articles a day. If you’re looking for a change of scene from department stores and night markets this weekend, why not head to one of these art markets in Taipei and support your local artists? Co-founded in July 2007 by the Taipei City Department of Cultural Affairs and the Taipei Cultural Foundation, the Red House Market for Artists & Designers brings together creative minds and tourists alike. Located near the Ximen shopping area and the historical Red House building, this market is one of the most talked-about art markets on the web. This art market offers a wide assortment of booths from the latest fashion items to handmade soaps and innovative home furnishings. Vendors will gladly introduce and explain the design and concept behind every one of their products. Positioned on what used to be a parking lot and flower garden, this art market is an extension of the famous NTNU night market that serves as a platform of creative learning and exchange. The Gongguan Flea Market at Taipei Water Park’s historic Water Metering Room Plaza is a popular shopping destination for those looking for interesting finds. The market itself is filled with hidden gems of not just second-hand goods, but also new products made by some of the most creative artists out there. The art market at Tianmu is divided into two sections: an art market, and a second-hand market. The art market is a place where artists and creators exhibit their most creative ideas — from music to images to design — and provide all sorts of customized services. The flea market, on the other hand, is a treasure trove of bargains waiting to be discovered. The multi-purpose park that this market is located in is perhaps best known as Taipei’s primary creative arts centre, as well as a hosting ground for some of Taiwan’s most significant cultural activities. Besides a variety of unique stores and restaurants that are open everyday, the park also houses an outdoor creative market based on a different monthly theme every weekend.